A new Chinese iOS developer’s team named "TaiG" (a.k.a. Taiji) has officially Jailbroken iOS 8 / iOS 8.0.1 / iOS 8.0.2 / iOS 8.1 / iOS 8.1.1 / iOS 8.1.2 / iOS 8.1.3 / iOS 8.2 / iOS 8.3 / iOS 8.4 Firmware Using Taig Jailbreak Tool available for iPhone, iPad and iPod Touch devices and compatible with Windows and Mac OS X operating systems. The latest available TaiG iOS 8 Jailbreak Tool is also packed with the Cydia Substrate, Cydia Mobile Substrate and UIKitTools integration. 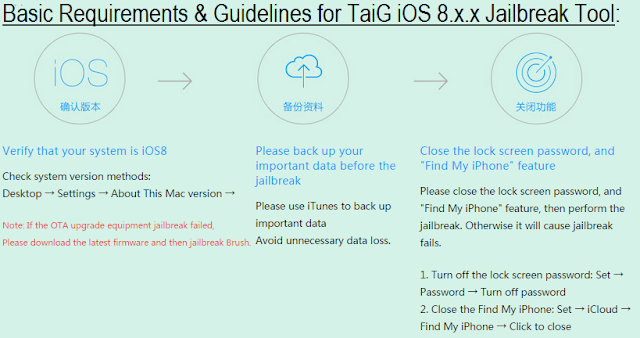 Taig Untethered Jailbreak for iOS 8 is supported and compatible with all iOS 8.x.x Firmwares installed on all iOS Devices. Apple users can successfully Untethered Jailbreak iOS 8.4 Using TaiG Jailbreak Tool on iPhone 6 Plus, iPhone 6, iPhone 5S, iPhone 5C, iPhone 5, iPhone 4S, iPod 6G Touch, iPod 5G Touch, iPad Air 2 6G, iPad Air 5G, iPad 4G, iPad 3G, iPad 2G, iPad Mini 3, iPad Mini 2 and iPad Mini. The official Direct Download Links of TaiG iOS 8.4 Untethered Jailbreak Tool for Windows and Mac OS X is available below. Other iOS 8 Jailbreaking Tools i.e. Pangu iOS 8 Jailbreak and 25-PP iOS 8 Jailbreak release are also expected soon. Note: Click Here to read full tutorial and guide on How to Untethered Jailbreak iOS 8.x.x Using TaiG Jailbreak Tool for iPhone, iPad and iPod Touch.